NASA is on track to launch the space shuttle Atlantis on Monday,but only if an unmanned rocket lifts off early Saturday as planned. Six astronautsare slated to lift off aboard the shuttle on Nov. 16 at 2:28 p.m. EST (1928GMT) from Launch Pad 39A at Kennedy Space Center in Cape Canaveral, Fla. They plan an 11-day mission to the International Space Station to deliver a cache ofspare supplies. "I'm happy to report that everything at Pad Ais going well," NASA test director Charlie Blackwell-Thompson said duringa briefing today. "We're not tracking any issues; all of our work is onschedule and progressing well." The weather outlook is promising for Monday's launch, with a90-percent chance of favorable conditions predicted. "Overall the weather does look very good forlaunch," shuttle weather officer Kathy Winters reported. The weather is also expected to cooperate for a scheduledUnited Launch Alliance Atlas V rocket launch Saturday at 12:48 a.m. EST (0548GMT) from the nearby Cape Canaveral Air Force Station. If the satellite-bearingrocket cannot get off the ground Saturday, though, both that launch and theshuttle flight will be pushed back a day. NASA crews shut Atlantis' payload bay doors this morning,enclosing a load of new parts for the station packed into two carryingcontainers planned to be attached to the backbone of the orbitinglaboratory. Payload manager Scott Higginbotham said stowing all the gearonboard the orbiter was an exceptionally tough job. "It's been a very challenging campaign for us, butwe're there," he said. "We're smiling today because we crossed thefinish line and we survived." Higginbotham said the ground teams faced many trials in coordinatingso many new parts into the carriers and the job took longer than expected. We have "two new carriers and a large number ofparts," he said. "The hardware wasn?t terribly kind to us along theway. It was far more difficult than any of us had envisioned when we began." Nonetheless, they completed their work on time, and theorbiter is ready to go, he said. 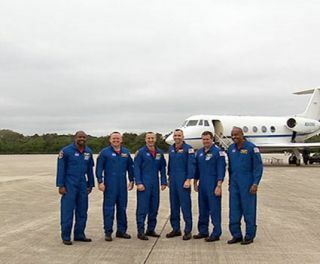 Atlantis' six-astronautteam, led by commander Charlie "Scorch" Hobaugh, plans to spend todaygearing up for launch. Hobaugh and pilot Barry Wilmore practiced landing at Kennedy Space Center this morning in a Shuttle Training Aircraft ? a Gulfstream II jetmodified to simulate the shuttle controls and handling. The STS-129 mission is Atlantis' second-to-last plannedflight. All of NASA's three space shuttles are set to be retired in about ayear or two.